Could the Indianapolis Have Survived the Submarine Attack? Did you know that the U.S.S. Indianapolis, which delivered the atomic bomb to Tinian and was torpedoed on the way to the Philippines, had just been repaired from yet another, previous bombing attack? Anyone who has ever seen the movie “Jaws” knows the great scene where Captain Quint, and Mr. Hooper and Sheriff Brody are sitting around drinking at night, telling stories and bragging about their wounds. Then Brody asks about Quint’s tattoo, whereupon Quint tells the story of being on the Indianapolis, which was sunk by a Japanese submarine after delivering the bomb. Its mission was secret, and there was a change of operational oversight by the officers on land who were supposed to be tracking the ship. Officers at Leyte—the ship’s destination—even recorded as having arrived, merely based on speed estimates. After being hit by two torpedoes, the Indianapolis sank in just 12 minutes. The Navy did not know the ship was missing for three and a half days until a plane on routine patrol spotted the men. Quint’s story in the movie was sobering. Although Quint made it sound like most of those who died were eaten by sharks, in fact, hypothermia, dehydration, and delirium took the majority of those who had gone into the water. Sharks tended to take the dead more often than the living. Only 316 of the ship’s complement of 1,195 crew survived. 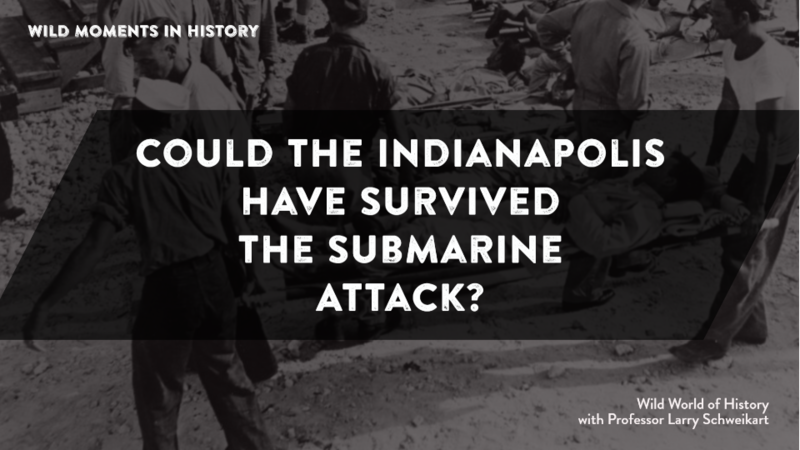 What Quint did not mention was that in March, just a few months before, during the bombardment of Okinawa, the Indianapolis was hit by a bomb, which blew a gaping hole in the keel. Indy partially flooded and listed badly as she steamed back to San Francisco to be repaired. It was only because of the bomb and subsequent repairs that the Indianapolis was available at Mare Island, in San Francisco, to transport the bomb. Had the Indianapolis not been hit by the earlier bomb, it is entirely possible she would have survived the war and Quint would have had no story. For further information, see Lynn Vincent and Sara Vladic, Indianapolis: The True Story of the Worst Sea Disaster in U.S. Naval History and the Fifty-Year Fight to Exonerate an Innocent Man.